Examples of short leader rigs. Click on the diagram to view a larger version. FishSmart is partnering with agencies, companies and organizations and anglers to improve the survival of red drum that are released in the South Atlantic. 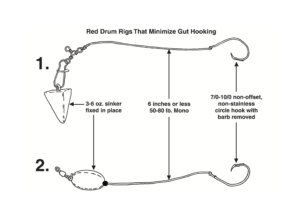 Studies have suggested that using “short leader rigs” when fishing with live bait can reduce the incident of deep hooking, making it easier to release red drum and causing fewer injuries to the fish. In fact, some states require the use of short leader rigs during certain seasons and in certain areas. 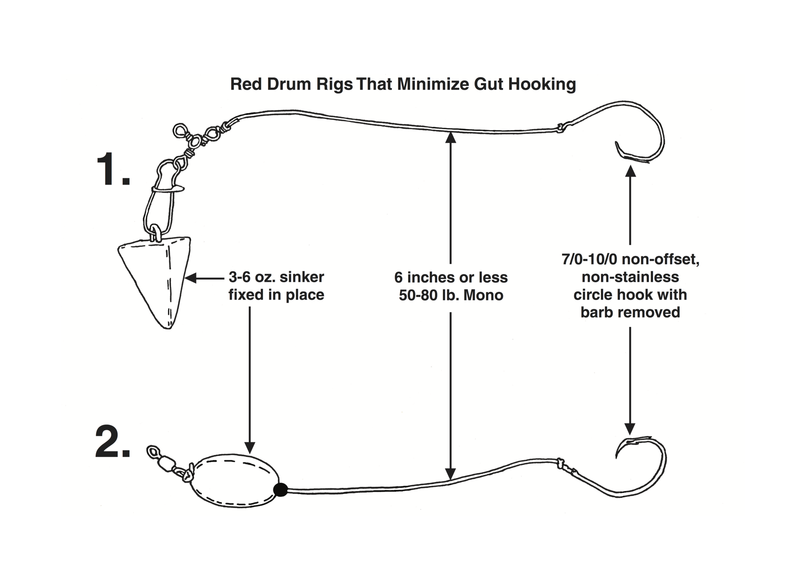 A short leader rig is easy to make or buy: an in-line circle hook with a fixed sinker not less than two ounces in weight, secured not more than six inches from the fixed weight to the circle hook. Watch this video on using a short leader rig.